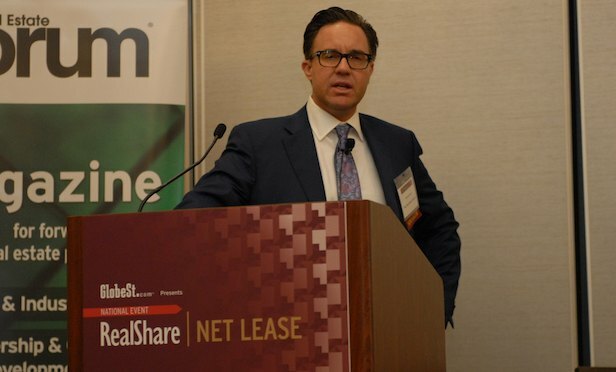 NEW YORK CITY—At the RealShare Net Lease Conference on April 5 in New York City, top professionals in the net lease development world openly shared what they look for when taking on projects. Panelist Mark Maughan, director of net lease investments at Sundance Bay, headquartered in Salt Lake City, UT, said his firm works with many developers and they must have a niche, for example, that’s geographic or tenant-based. “Some developers are known in a specific region and tenants come to them. Some groups are really good at getting their preferred developer relationship with Dollar General or CVS and they’ll chase a specific tenant all over the country,” said Maughan. Developers can excel at doing value add, buying existing buildings and bringing in tenants. Sundance Bay looks at whether the tenants have a niche, a track record and a balance sheet. The moderator of the “Increasing the Inventory: 2018 Sector Developments” panel Matt Bear founded Bear Real Estate Advisors, headquartered in Las Vegas, NV. When he said, “The best real estate is covered up with bad buildings,” the audience chuckled. Bear said the first 10 years of his career were in Las Vegas when the population literally doubled. “It was a market where you ‘Build it and they will come.’” He then asked, what are developers doing to increase their deals? Panelist Ben Hidalgo, principal of Net Lease Development, based in Fort Worth, TX, focuses on franchises and single corporate tenants. He works with many national QSRs (quick service restaurants) including Arby’s, Starbucks, Steak ’n Shake, Taco Bell, to name only a few. Today’s challenge is finding good sites, according to Hidalgo. Maughan said the tenant drives the business because unless you have a signed lease, the investor does not have a deal. The tenant also drives the timing of many deals. Landowners often want to sell their land in 90 days. But for the developer to close, they need to have a signed lease in hand. View the complete article on GlobeSt.com. To Bear, that is the number one threat to the industry over the next year or two. LAS VEGAS — Matt Bear, a 28-year commercial real estate veteran, has launched Bear Real Estate Advisors LLC, a boutique real estate services firm. The company focuses on buyer representation for 1031 exchanges, national single-tenant investment sales and acquisitions, net lease investments, joint venture advisory, capital structure advisory, build-to-suit developments, debt/equity, specialized search and family office/professional investor buyer representation. Prior to founding Bear Real Estate Advisors, Bear served as vice president of CBRE and was previously a principal with Avison Young. In 2001, Bear was a founding partner of Venture Development Group, which specialized in the development of single-tenant buildings, neighborhood shopping centers and power center projects. In addition, Bear is a member of the International Council of Shopping Centers (ICSC), from which he earned the senior certified leasing specialist certification. View the article on REBusinessOnline.com. LAS VEGAS—Matt Bear has launched Bear Real Estate Advisors LLC, a boutique real estate investment services firm. The firm focuses on IRS Section 1031 exchange buyer representation, national single-tenant investment sales and acquisitions, net lease investments, joint venture advisory, capital structure advisory, build-to-suit developments, debt/equity, specialized search and family office/professional investor buy-side representation. Providing services on a national basis, Bear Real Estate Advisors will provide a unique approach to brokerage services by delivering a combination of brokerage, advisory services and a relationship-first point of view. View the full article on GlobeSt.com. View this article on the Shopping Center Business website. A Las Vegas commercial real estate broker has launched his own firm. Matt Bear, formerly of CBRE Group, announced Monday that he formed Bear Real Estate Advisors. His focus will include single-tenant investment deals, build-to-suit developments and 1031 exchanges. Under a 1031 exchange, the Internal Revenue Service lets real estate investors postpone paying taxes on the profits from a sale if they reinvest the proceeds into a similar property. Bear, 46, most recently was a vice president with CBRE, which he joined in 2014. He also worked as a retail-property broker at Avison Young, joining the firm in 2012, and co-founded retail developer Venture Development Group in 2001. View this article on the Las Vegas Review Journal website. Matt Bear, a commercial real estate veteran with nearly three decades of investment services experience, has launched Bear Real Estate Advisors LLC, a boutique real estate investment services firm that will provide a combination of brokerage and advisory services. The firm focuses on IRS Section 1031 exchange buyer representation, national single-tenant investment sales and acquisitions, net lease investments, joint venture advisory, capital structure advisory, build-to-suit developments, debt/equity, specialized search, and family office/professional investor buy-side representation. Bear has 28 years of industry experience, and prior to founding Bear Real Estate Advisors, he was vice president with CBRE and principal with Avison Young. View the entire article here: The DI Wire.